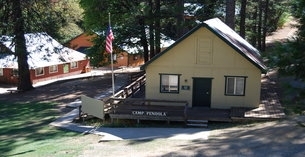 Camp Pendola is a traditional summer camp in the foothills of the Sierra Nevada. Located 2 hours north or Sacramento, Camp Pendola is owned and operated by the Catholic Diocese of Sacramento. All campers experience at least one overnight "under the stars" in addition to traditional camp activities of arts and crafts, archery, swimming, and hiking. Primitive screen cabins with no electricity, stand alone shower and restroom facilities.